Joining us for this week’s tasting is Natalie, the directorÂ Downtown Development Authority. The DDA is responsible for the recruitment of new businesses and developing the downtown through design, as well as planning many events and activities that occur downtown. Be sure to check out the Wine Crawl in downtown Wyandotte later this week in conjunction with the monthly Third Friday event. This trip to put us just over , leaving us with 18 flavors to go. To help us celebrate our halfway point, we invited our friends from Wyandotte Patch, my boss and editor and freelance writer . 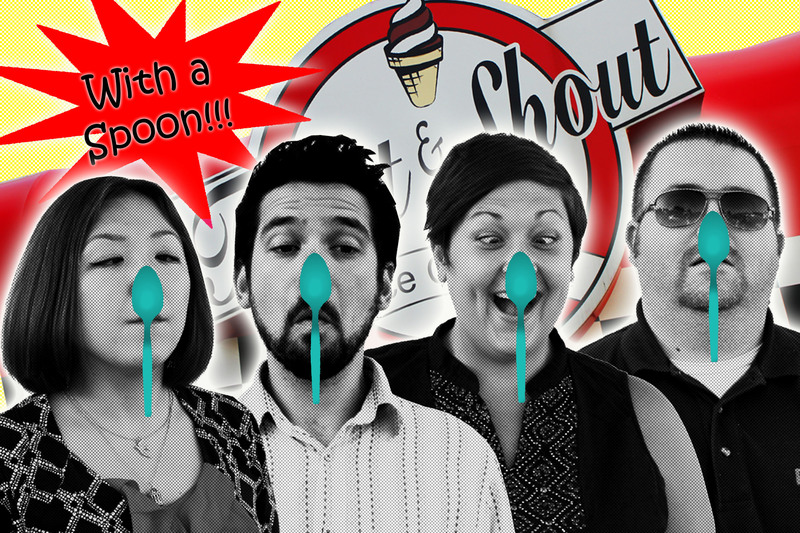 Get your spoons ready, we’ve got four flavors to try! After , I wanted to make sure we picked a winner. With four people and four flavors though, the results were varied. But since I write this article and take the photos, my vote weighs a little heavier. Just sayin’. We tried chocolate, blueberry, pistachio nut and peanut butter. 5 Spoons across the board! What else can I say? It’s a classic flavor and the Twist N Shout does it really well. Whether you are a person or a chocolate person, you’re in good hands here. The fruit flavors have been hit or miss so far. Some winners, and some not quite losers, but just not strong enough of a flavor. So when I selected blueberry, I really didn’t know what to expect. But fortunately, this was really good and actually tasted like blueberries. As I ate it, I couldn’t help but think about blueberry muffins, blueberry pancakes and other blueberry treats that are so good. Jason liked it so much we switched flavors. We all gave it 4 spoons except for Aya. She gave it 2, claiming it tasted like blueberry bubblegum. It was three to one on that vote. You decide. Melissa selected this flavor and was a little disappointed. I won’t lie, I have to agree. I had high hopes for this flavor. I don’t care for pistachio nuts too much, but I have had pistachio nut ice cream before at . I may have been 10 years old when I tried it, but I remember it being fantastic. I guess a lot can happen in 20 years though. Maybe I only liked it for its intense green color? It wasn’t bad, it just wasn’t awesome. We all gave it 3 spoons except for Aya, who must have been extra critical after trying her favorite flavor chocolate (She’s been waiting 6 weeks to try the chocolate.) She gave it 1.5 spoons. Yeah, that had to be the chocolate talking. Jason excitedly picked this flavor because he loves peanut butter. But his excitement was squashed when he tried it, claiming it wasn’t peanut buttery enough. I, on the other hand, loved it! I love peanut butter, too. I may or may not have been known to stand in the kitchen with a jar of Jif and a spoon. Peanut butter is so good. But if you’re expecting big chucks of peanut butter when you try this, this isn’t for you. It’s peanut butter flavored soft serve. Interesting fact about Jason is that he loves peanut butter, but doesn’t like peanuts. How about that. And he hatesÂ raw tomatoes, but likes tomato sauce. And I thought I was strange!? I gave this flavor 5 spoons, Melissa and Aya gave it 4, and a disappointed Jason gave it 2 plastic spoons. Boo! I do understand some people don’t think that peanut butter can’t stand by itself. But with chocolate ice cream in one hand, and peanut butter in the other, put your hands together! Introduce yourself to the most perfect couple that has a beautiful blissful marriage. If only we could all be in a relationship so perfect. We all agreed that a chocolate PB twist was spectacular. Joining us this week is Melanie McCoy, general manager of Wyandotte Municipal Services. WMS has launched the “Save a Watt in Wyandotte” home energy audit program. This program is aimed to help Wyandotte residents get free, deeply-discounted energy-efficient upgrades. If you haven’t scheduled your free home audit yet, click here for more information. Just think about how much more ice cream you could buy if you saved extra on your home energy bill. Coming off of last week’s multiple 5 plastic spoon ratings, I was a little lost at what to select next. I knew it was unlikely to have more exciting 5 ratings, but I was pleasantly surprised with what was chosen: banana, praline, and butterscotch. I usually don’t like artificial banana-flavored things, such as banana-flavored candy or gum. But I do like bananas, more so than I ever thought. I love banana cheesecake, banana crepes with Nutella drizzled over them, banana French toast with a little cinnamon and nutmeg, and that banana pudding with the vanilla wafers. Yeah, that stuff is awesome. Even my current favorite Razzle from the is banana cheesecake with banana ice cream, bananas, and chunks of cheesecake in it. So with my banana background, it’s no surprise that I gave it 4 plastic spoons. It’s not an overpowering fake banana flavor and stands on its own pretty well. Aya and Melanie gave it 3 spoons. I’ve recently discovered how good pralines can be, but I still avoid that nutty stuff in ice cream. But to my surprise, this was really good. If I wasn’t really in a chocolate mood, or a fruit mood, I’d put this in my rotation for sure. It might even be a good base for a Razzle to mix in some other fixins’. We all gave this a strong 4 plastic spoons rating. I don’t have much emotion (or experience) when it comes to butterscotch. I remember having butterscotch pudding as a kid, or once in a great while have butterscotch syrup on a homemade sundae. It’s not bad, but I would never request it. I don’t even really know what it is. Does it have scotch in it? So after a brief on-line search it seems the main ingredients are butter and brown sugar. No scotch that I could find. So how can something loaded with butter and sugar be bad? Well, in our little group of three, we didn’t think it was bad at all. We all gave it 4.5 plastic spoons! Almost a 5, but not quite. We have 15 flavors left, including the dreaded “licorice” looming ahead. 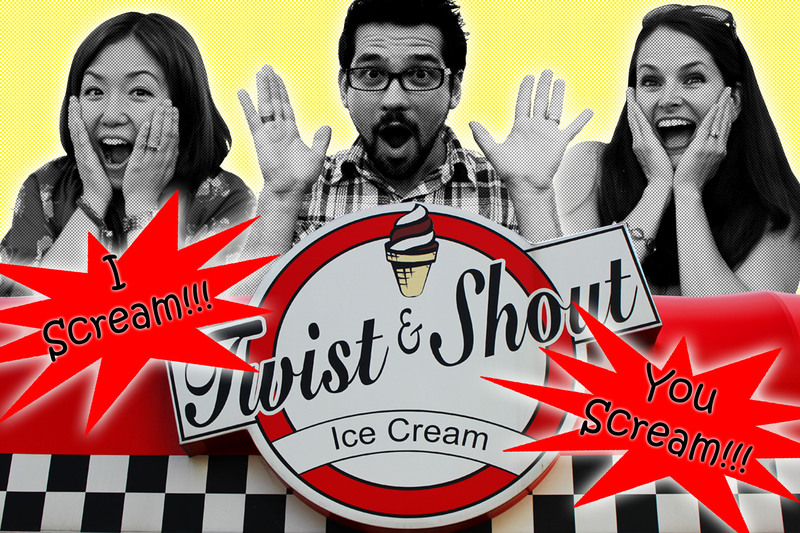 Once upon a time, there was a librarian named Kelly Ray who went to try ice cream with two crazy people at the Twist & Shout. She decided to try the most dreaded flavor on the menu, licorice. Kelly is the youth librarian at the . She does a great job with all the different youth activities at the library, from story times to reading programs and other special events. My daughter loves going to the toddler story time there, and I think I’ve learned a thing or two there myself. 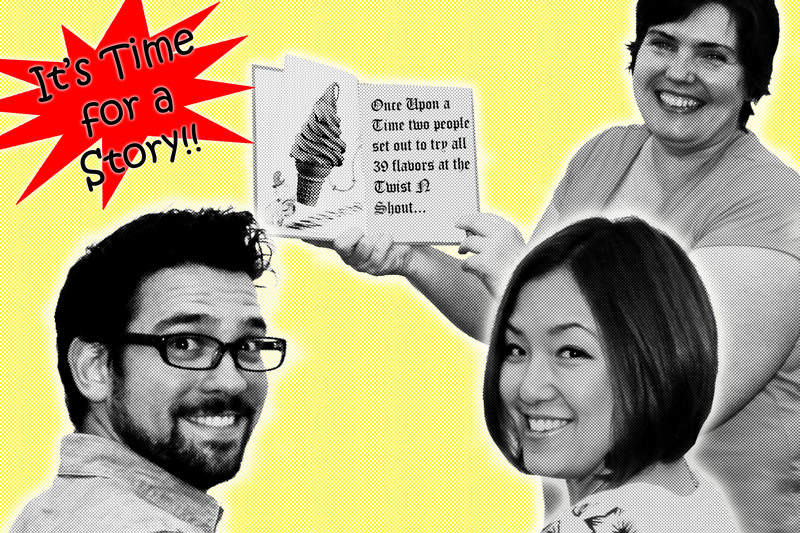 Story times for infants, toddlers, and preschoolers start up next week. This was really good. It tasted like Kaluha. I put it in the category of being really good, but I probably wouldn’t order it again. However, I think it’d make a great base for a Razzle. Kelly and I gave it 4 spoons, and Aya gave it 4.5 spoons! Ugh, the time to try the dreaded licorice flavor had arrived. And the worst kind of licorice, black licorice. This has to be one of the worst flavors in life. I hate this flavor so much it makes me angry if I ever have it. If the devil had a flavor, it would be black licorice. It boggles my mind how anyone could be OK with this flavor. Not only are people OK with it, some people even like it! What!? People love a candy that is pitch black? Black licorice looks like a candyfied version of used motor oil. Then there are candies that try to trick you, like Good N Plentys. Nobody would expect the taste of death from a candy that is pink and white. There is nothing “good” about them and I would not want “plenty” of them. Kelly was so happy though when she announced this was the flavor she was choosing. I guess it was best to get it out of the way now instead of trying it last. I was very surprised to hear that we were not the first people to order this flavor. I can accept that people like licorice, but to like it enough to want it in ice cream form, I just can’t comprehend this. I was surprised that when served, the ice cream was white. It looked like vanilla. I was expecting it to be a dull grey or shiny black like Satan’s boots. I mean Santa’s boots. This was awful! My vision blurred and even though it was ice cream, my tongue caught fire and I started sweating. I gave this zero spoons. Kelly said she doesn’t mind black licorice, but it wasn’t the greatest in ice cream form. She gave it 2 plastic spoons. She said the more bites she took, the less the licorice intensity was. I think that’s because it made her taste buds numb. Aya gave it two plastic spoons, saying the ice cream factor softened the blow. Joining us this week for our ice cream tasting at the was . Doug is president of the and owner of a computer repair business, Electronic Brain Solutions. He is also involved with the WBA cable TV show In Focus, which airs on Wyandotte Cable channel 15. Check the Wyandotte Cable Access schedule for times. The WBA coordinates the Third Friday events each month and this month is the. So come on down on Friday and check it out. Fifty Amp Fuse will be there! This was awful and awesome at the same time just like was. (Interesting story about Doug: He hates watermelon now because of a watermelon eating contest gone bad when he was a kid.) Have you ever seen that old cartoon called Grape Ape? Well, this is exactly how this tasted. Imagine any artificially grape-flavored thing ever made and that’s what this was like. Grape jelly, grape cough syrup, grape drink, grape candy, grape Popsicles, etc. So if you like that flavor, you’ll love this! I gave it 4 spoons, Aya and Doug gave it 2 spoons. This was a big disappointment. I was expecting the taste of a custard donut filling, but it didn’t taste like much of anything. It didn’t taste bad. I just couldn’t think of anything it tasted like. I felt blank. Aya loved it and gave it 5 spoons. Doug and I gave it 3 spoons. With the fall-like weather we’ve been having, this was an appropriate flavor to try this week. I love pumpkin-flavored things. Pancakes, muffins, donuts, pudding, creme brulee, ravioli and PIE. And when it comes to sweets, anything pumpkin flavored is usually pumpkin pie flavor. This flavor kept to its word. Pumpkiny, spicy and ice creamy.Â It’s a good combination. Doug and I gave it 5 spoons, and Aya gave it 4. I highly recommend you grab a pumpkin cone (or a cup) to enjoy as we enter fall.